Your Eyes Can Deceive You. Don't Trust Them. Over the years, I've often drawn parallels to my life and the lives of my favorite Star Wars characters. (Admit it, so have you...) Certainly, many of the parallels have come when I'm tempted by something - say, when I have the opportunity to purchase an unnecessary amount of merch (though I suppose we could debate the definition of "unnecessary"). In those instances, the inner-narrative plays something like this: The voice of Palpatine calling to me, "You want this, don't you...?" 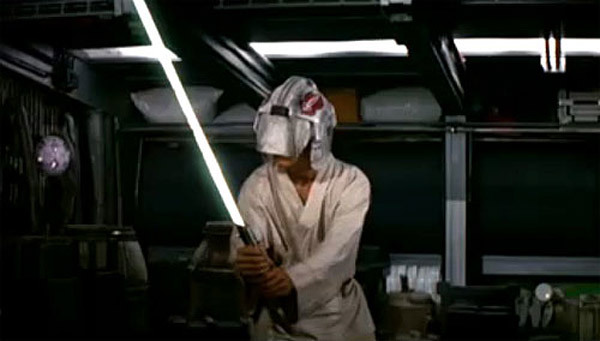 The image of Luke Skywalker turning away - fending off the desire to give in. Then, the inevitable voice of Vader, beckoning, "Give yourself to the Dark Side..."
Finally, the moment of truth - whether to click the Purchase button, or not. So, on the eve of this endeavor, I think about Kenobi's words from, um, a certain point of view. How much of our lives do we make choices based solely on what we can physically see before us? We tend to examine the evidence before us in so many situations: investments, relationships, purchases, the list goes on and on. In fact, many people often travel to a store to physically touch and look at an item before later purchasing the item online. Indeed, we rely on our sight of the tangible for so many aspects of our lives. What this leaves me wondering though is this question: Where in life is there room for trusting the unseen? Under what circumstances might we embrace the words of Obi-Wan, and lean not on our sight, but instead trust in something beyond the physical? What are your thoughts? What experiences have you had that mirror this exchange between Luke and Obi-Wan? Where did you rely on what you couldn't see? What is Supreme Leader Snoke?